If you have completed your studies, then you are not getting the proper job that may be two such reasons, First, it is related to the country's conditions, good governance or may be related to the job market. But the employment relationship or the lack of better job than individual attitudes, which can be repaired. that is a way to that unemployment can achieve better employment and job seeker can get a better job. During unemployment or job seeker can not grow and facing difficulty for became a getting job that can In addition to a good degree, experience, skills, communication skills in their work but most necessary thing that called "Links"
Their 'links' are removed all their weaknesses.that is mean Relations are the better for the job acquisition or development are of great significance. 2.How to do a better relationship? from traditional methods To establish better relationships with successful people is quite difficult to work, and keep continues these relationships are the most difficult task. Despite the sacrifices, there is no guarantee that the person who will work for you or not. then who what doing for getting the job? so as like people promote their self-marketing, from promoting the more prominent your strengths. For this, you can see an example of our society like "Politics men" Because they do not want to miss any place to advertise from their hand. 4.How to Self-marketing or personalized advertising? in this time so many people have born question in mind that how can I advertise to my self that it is not a good thing to personal publicity, this would reduce my honor, I will starve the concept of fame. LinkedIn is a social media network for the job, LinkedIn is working for people since 2003.
this time the proper member of LinkedIn is four hundred million people around the world. because of the main purpose of LinkedIn for business to a related networking group. 'LinkedIn' allows its members to ensure that they can connect to other people on the platform.because you can develop a relationship with people in your field and industry very soon. The LinkedIn basic version is free that have no fee, But it is also a premium version that has the regular fee. This usually paid version use by heads of the corporation, more like companies CEOs of the company. Why 'LinkedIn' traditional CV is not effective? Because he is aware that CV candidates have not been created CV but built up by a networking club. While the number of companies able to find the person in the small CVs is a challenging process. It also, in recent years like world also in Pakistan through the LinkedIn to the worldwide increase in the number of jobs. through the 'LinkedIn corporations recruitment specialists are capable of finding the right candidates through more' quickly and effectively. such as you enter your city name with your name address that your profile be unique. Write career information briefly comprehensively try not longer than three hundred words. In which sector you want to work it must be stated in the introductory paragraphs. For example, 'I want to work webmaster. Mostly People mention only the most recent job profiles. Mention your previous jobs so that all your experiences can be estimated as / better skills. Work well with comfort on your profile. This is a challenging task. But getting a job profile will be much more job opportunities. remember one this in your mind before the interview call your profile will be first checked. So be calm, even take one day you must enter all your features to your Profile. you must mention your skills and expertise. Describe all your professional skills. For example, if you belong 'Architecture' You'll write to designing, estimation of costs, the Supervisor, the Model Making, Auto Cad etc. If you have technical skills. mean the purpose that mentions your goal is to do whatever skills. Find at least three to five successful people that who can express their good feelings on your profile. recommendation of 'Successful people' in LinkedIn to have a substantial impact. Try that they are people who have worked in the past. Which would mean that they were satisfied with your work? Such 'recommendation' will become more impressive your profile. 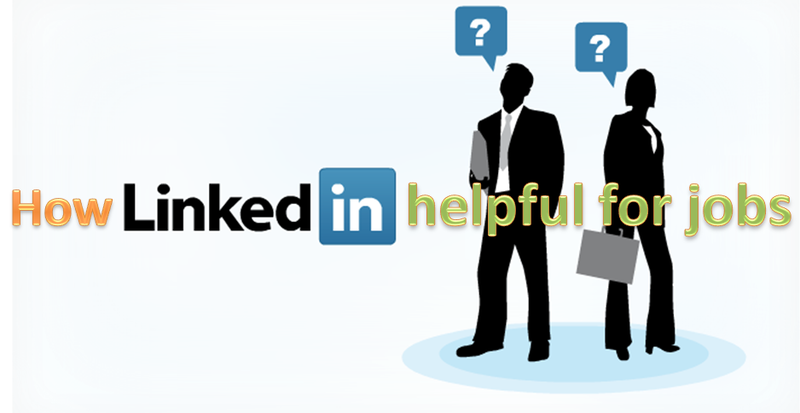 To improve the LinkedIn your profile that for available many videos on 'YouTube'. Only those videos you can watch in your spare time. in LinkedIn with complete your profile and try to connect with other professionals in your field. Which is very beneficial. Professional friends can help you to get a job in their company. Do not imagine like other social media such as Facebook, because of LinkedIn a professional network. Create your professional identity and not express their religious, ethnic, linguistic, political, ideas and don't try to connect to those who have no connection of any kind to you or your field. to do so may be considered spam (SPAM) Your profile. How LinkedIn helpful for jobs A few tips for the effective use of LinkedIn, How to Self-marketing or personalized advertising.